I want to thank Vidya Sury to have given me the wonderful happiness quote which is. Happiness is a DIY project. And today we discuss how a happy mid-twenty needs to choose his or her battles well. Is everyday a twenty four hour period filled with minutes of undue pressure on your head? Do you not spend a single waking minute not thinking about some unfinished task? Then my friend you have taken more than the share of your scheduled problems. If balance is the way of life then how come you are perennially shouldering a responsibility?Where is the yin of this yin-yang? Where is the better half? Well each day brings in an overload of information from all quarters. Kids are not doing well in class or spouse is cranky again. Parents are calling to ask about the latest pay hike. And perhaps boss is not looking too happy at the prospect of it. To top it all we ourselves assign milestones to life. And time is running away without touching any of these. Look back, are you sure each one of these make your life? 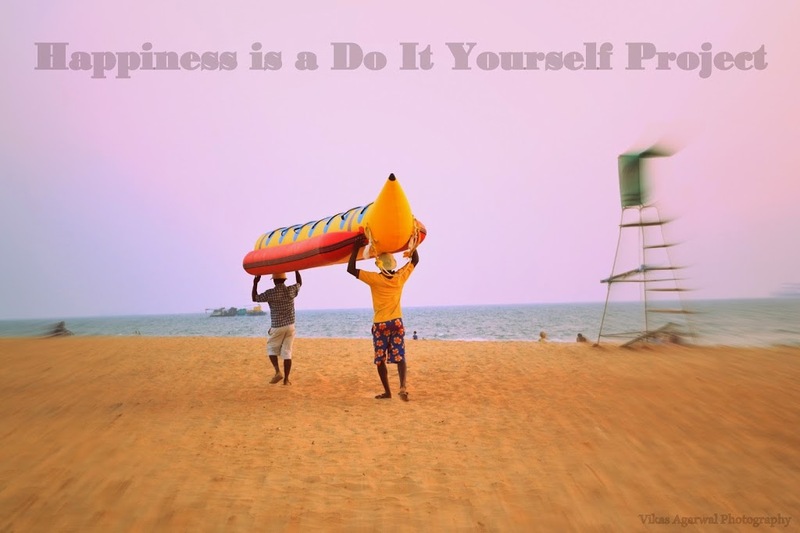 Do you think every single of those tasks is crucial to your happiness? Think deep. Remember what your end goal is. Not to conquer the world but only to be happy. And like Happiness is a DIY project, it is also a report card too happy to achieve minimum goals. Choose your own battles. Design your life yourself. Today morning I had a test to take. A test if passed would have ensured that I get four levels of jump at work. On the other hand I had a lot of writing deadlines to finish too. I could have juggled both but ensured only fifty percent rate of return from each. So instead I sat down for five minutes in the morning and thought deep. What would make me happy? Four levels of grade jump, which is a long journey to make in any case. Or perhaps to maintain my writing cycle and start a new week without a backlog. Well my heart told me to work on the newsletter and hence I am here typing this. our choices define us always no? There are only so many hours in the day – it’s up to us to choose what’s important to us and how to spend them. Great post! Awesome read! Even if you fail in the battle, but not on the war. Failing in battles is making me strong. I am glad that we , as humans, have the capacity to make choices. At times, the choices may not be the best but we learn from them. That is the power of doing something. To err, pick ourselves up and not repeat the mistake again. Nice, introspective post, Richa. The gift of choice is a double edged sword, but one to cherish too. Great points here, Richa. Good read Richa! by the way I too opened a facebook page ,its called The Lazy Writer!